With our quality service and exemplary products, First Choice Gutters and Siding will provide you with top-notch roofing services for your Omaha-area home. Whether you are in need of a roof replacement or a few roof repair, we are Omaha’s local roofing contractors. Whether your home’s roof has been damaged by storms, high winds, or just day-to-day exposure to the elements, First Choice is here to help with all your roofing needs. We offer free estimates and trustworthy, reliable service in order to get your roof repaired or replaced as fast and effectively as possible. If your roof leaks every time it rains, perhaps it’s time for a roof replacement. A full roof replacement can be expensive. Don’t let that scare you from fixing that annoying leak, or repairing those hail damaged shingles. 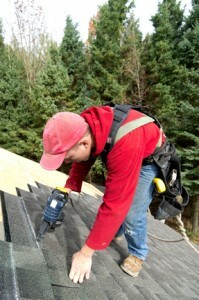 Our roof replacement experts inspect your roof fully prior to beginning any replacement work. We use only top of the line, high quality materials at First Choice. Many people put off having their roof inspected for hail damage, wind damage, or normal storm damage as they aren’t fully aware of just how much damage a Nebraska storm can do to their Omaha home’s roof. Hail damage is often the number one cause of home’s needing a roof repair. When you have noticeable hail damage, the interior of your home is at risk. Have a roofing expert from First Choice come out and inspect your roof to assess where there is damage or worn shingles that are in need of some repairs. Damaged shingles doesn’t necessarily mean a full roof replacement needs to be done. Our roofing experts can come out, assess the damage, and repair only the damaged shingles needing repairs. If you need a roof repair service done, contact First Choice. We are Omaha’s first choice for roof repairs. First Choice has a variety of roofing material and roofing shingles available for your Omaha-area home. We work with all roof types. We offer many different roofing materials to match your home’s functional needs as well as your home’s aesthetic. Our trained roofing professionals will help you decide the perfect roofing material for your home. We are the Omaha-area roofing contractor who will provide you the best roofing material for optimal performance and beauty. First Choice Gutters and Siding offers only the best roof brands. Our trained and friendly roofing professionals will help you decide which brand is the best choice for your home. We work with all budgets and all specific roofing needs to provide fast, efficient service to create your home’s best roof ever. We are also trained and certified in asbestos abatement. Our trained technicians will make your Omaha-area home safer with First Choice’s certified asbestos abatement services. We have a strict attention to detail and an intense focus on safety and regulatory compliance when it comes to asbestos abatement. First Choice will handle everything from removal to disposal while keeping your home and your family safe. Fill out our contact form or call First Choice Gutters and Siding at (402) 498-9300 today to get started with the roof repair or roof replacement process for your Omaha-area home!